June 2009: With the arrival of the first wave of Mark One War Droids on the shores of Great Britain to climax Book Five, everything in Pat Mills' Savage that has spent the last two years threatening to change does so, terminally and completely. It, at last, pulls the strip completely away from its previously well-regarded incarnation as a grim, real-world resistance thriller and into the lowbrow (but fabulous) science fiction world of The ABC Warriors and Ro-Busters. I think that it's possible to mourn the loss of the thrilling, grounded world that was presented in the first three Books of the series, as drawn by Charlie Adlard, while also celebrating the new world of robots and other bizarre super-tech that makes up the Patrick Goddard-drawn larger chunk of the series. I write this as Book Eight is winding down to its conclusion in contemporary issues of 2000 AD. The smart money is on the next book in the series being the final one. As much as I love 2000 AD, I do think that there are one or two things that the editorial droids could do to improve the experience, and not put quite so much on the readers' shoulders. True, we readers could take the initiative and dig out our back issues, or call digital copies of 'em up from the recesses of our laptops, or even consult Wikipedia before a series returns for a new outing, but, hey, some of us are busy adults and parents now and don't have the time to commit every detail to memory like we did in the 1980s, nor the time to do a quick bit of research before starting a new story. I say this because, if we must go months and months or, literally, years between stories in a series, Tharg, then the least you could do, Tharg, is program a short recap or prologue episode before the new story begins. 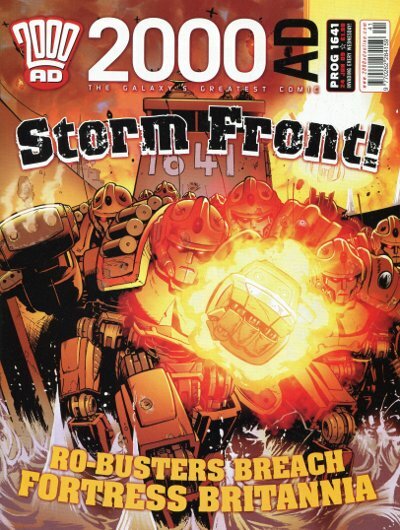 I'd honestly rather see a detail-packed two-page prologue to Defoe and a two-page prologue to Damnation Station sharing space in the issue before those two series return than I would a one-off Future Shock that nobody's ever going to remember. I mention that because Book Four of Savage pulled a trick that quite a few readers missed at the time. (No, not just me!) After the first three books in the series were set one after the other across two months in 2004, there's a gap of three years before Book Four. And then Book Five is set two years further on. Unless you're paying attention to the date in the narrative captions, which some of us are evidently pretty bad about doing, then you're bound to be wondering why in the world the story is acting like the Volgans never left Britain when Book Three ended with the occupying force pulling troops out. In the three-year gap between stories, it turns out, the Volgs acted remarkably like some real-world forces did in the middle East while deciding whether the "host" nation was ready to conduct its own affairs and, "regrettably," elected to force themselves back on Britain with a "surge." Now, to Mills' credit, most of this really is spelled out in black-and-white with dialogue, but a lot of it is also hinted. He's trusting readers to get all the nuances of his story, but at the same time forgetting that his audience is no longer made up of young readers with the disposable time to read each episode five or six times before the next one is printed, but, honestly, grown-ups with a heck of a lot more going on in their life. If Savage were to appear as an annual sixty-page chunk, then perhaps it would read even better. Truly, even after three episode-by-episode reads of Books Four and Five, which I found rewarding but mildly frustrating, it wasn't until I sat down with the collected edition that all of the material firmly clicked. I understand that it seems counter-intuitive to suggest that older readers need a little more background information than younger ones, but things are different when you can't afford the time to give a weekly comic book all of the attention that you desire. The funny thing, of course, is that older readers will often mask their "I can't understand it" complaints under the guise of being concerned for younger readers, who could not possibly comprehend something so confusing, which is balderdash. I read a Doctor Who forum where that's one of the principal complaints about the recent episodes, that kids could not possibly understand what the heck is going on with twisty timelines and paradoxes and time babies and Weeping Angels, when there's no empirical evidence that any child, anywhere, is actually confused. And that's the complaint that leads DC Comics to restart and refurbish their continuity every six years or so, because things are allegedly too confusing for "the kids." Well, no, I had no problem as a six year-old understanding that this Batman was from Earth-One, and this Batman was from Earth-Two and has a daughter who's the Huntress, who aggravated the criminal in the tiger costume who previously had that name and is also called the Tigress, and so on. No, kids understand this stuff just fine. It's just that parents have mortgages and insurance bills sucking away vital thrill-sections of the brain, and we could use a little help, Mighty One. And with Defoe, we could use a lot of help. Again, it's a terrific series, but with the beginning of Book Three in prog 1640, Mills seems hell-bent on forcing every reader to either keep a running scorecard of the characters, or just ignore them all, say that Titus Defoe, his ally Damned Jones, and their enemy La Voisin are the only characters that matter, and everybody else is background color. If I remember the anecdote, it's actually Mills himself who suggested that team-led series don't work in 2000 AD, with The ABC Warriors being just about the only exception. (I'd say probably the original V.C. 's as well, but there weren't very many of them.) What Mills might have forgotten is that each of the Warriors was introduced as a huge presence on their own right. The story began with the already established Hammerstein and two very individual characters, Joe Pineapples, the world's greatest sniper, who then only talked in short bursts of letters and numbers - "J4! A1!" - and Happy Shrapnel, who was a demented hillbilly robot in a coat and hat who went "Bzzzt!" all the time. Kind of hard to confuse those three. And as the weeks went on, each new Warrior was introduced in standout stories with easily identifiable traits and quirks that were repeatedly hammered in with every subsequent story. Mongrol was the big one with the catchphrase "Smush!" who shouted the name of his "creator," Lara, all the time. Deadlock was the one with the giant, toothy grin, cloak, sword, and strange magical powers. Blackblood was the villain who went "Hssssss!" and drank oil and was programmed for treachery. You can't read their introductory adventure and forget them, ever. Defoe has a cast of a couple of dozen characters, and there's absolutely no telling which of them are ongoing supporting players and which are passing in the night. I swear that bare-knuckled boxer who moonlights as a dung collector in Book Two got more screen time than half of Defoe's Dirty Dozenne of zombie-killing captains, and he got burned to death by a bunch of fire reeks. Book Five of this series is said to begin in the summer, and I'm certainly looking forward to it. It's beautifully drawn by Leigh Gallagher, I love the quiet tough-guy dialogue from the hero, and it's got more bizarre and wild ideas than you can count. Unfortunately, it's also got more characters than anybody can count, either. I am old and decrepit and it's been three years since the last story. I don't know about you guys, but I sure could use a refresher before all the bloodshed recommences. What were we talking about again? Did I have something to say about robots? Next time, Armitage and Darren Dead are at large in the Megazine. See you in a week!